Four diplomats from Zambia and Botswana were involved in a road accident at Lukenya bridge on Mombasa-Nairobi Highway on Tuesday, February 26, 2019. Nairobi — Zambian High Commissioner to Kenya Brenda Muntemba has succumbed to injuries sustained during a road accident in Lukenya last month. Foreign Affairs Principal Secretary Macharia Kamau confirmed Muntemba died at the Nairobi Hospital's Intensive Care Unit (ICU) where she was receiving treatment. 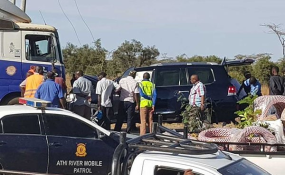 The accident occurred in Lukenya when a trailer collided head-on with the vehicle carrying her together with Botswana's ambassador to Kenya Duke Lephoko who survived the crash.